Conventional methods of composite tooling has two predominant downfalls- the process is too time-consuming, as well as expensive. So what is the solution? FDM 3D printing technology. The potential for FDM tooling to disrupt the composite tooling supply chain is significant and, having been recognised by manufacturers across the world, is being increasingly adopted within composite tooling production processes. Discover how Swift Engineering utilises FDM technology in their composite tooling. Implementation of FDM composite tooling offers a distinct advantage over traditional methods of manufactured tooling. FDM tools can be made with complex yet highly functional designs that are tailored to your manufacturing process, without sacrifice of cost or lead time. The design process in general for FDM tooling is predominantly driven by the process parameters for the final composite part, such as cure cycle, pressure and bagging approach. For example, the cure cycles dictates material selection, while both pressures and bagging approach will impact the design style and overall construction. FDM tooling is typically designed in one of two major styles; shell or sparse. 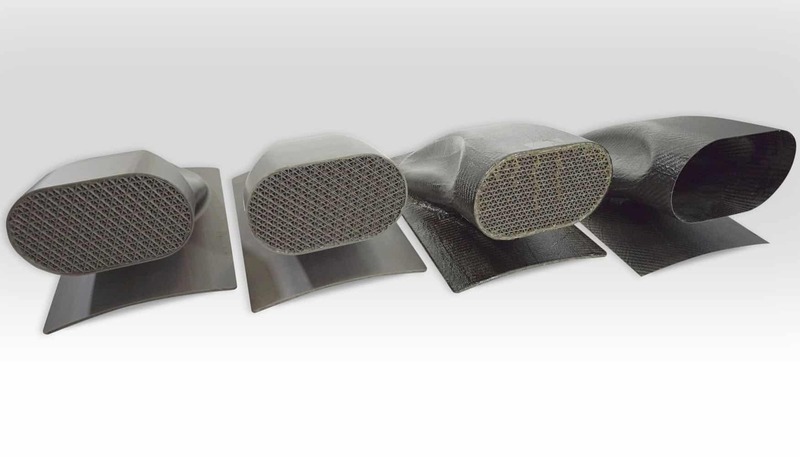 However, FDM composite tooling allows designs to be as complex, simple, or functionally oriented as the application requires, due to the lack of design limitations when using FDM 3D printing technology. Typical shell style tools use less material and allow for faster building than sparse style counterparts, especially where envelope bagging is preferred. Whereas, sparse style tool design uses the shell tool as a base, but reinforces the shell by building an internal fill pattern or support structure. Sparse style tools are often used when surface bagging or tool rigidity is required. Regardless of the tool style designers should always strive to minimise material usage, optimise print time and look to improve quality for any given application. Tailor the tool design to its intended use, remember that both repair and development tooling often do not need the robust construction that production tooling does. Design from the composite laminate, not an existing tool, this will aid in reducing excessive bagging area. FDM tooling in general only requires approximately 2-3” beyond the EOP for bagging materials. Shell style tooling minimises material use over sparse style tool designs, particularly when envelope bagging. During edge bagging sparse style tool designs, take care to print them with open ends and large air gaps of up to 2”. This could reduce your material use, as well as improve air flow during the cure cycle stage. Self-supporting angles minimises support material usage. Although overhanging features need support material to reinforce them during printing, this process can significantly extend build time and increase material use. Self-supporting angles eliminate the need for support material and will reduce the amount of material you require overall when implemented in the long run. Ensure the layup surface orientation of the tool is printed vertically, with the least amount of support material. Vertical orientation enables the best surface finish to be achieved through a reduction in stair-stepping, therefore resulting in maximum surface quality and minimal post-processing work. This is because ‘Flat’ build orientation often results in a significant amount of support material, as well as a lower resolution on the lay-up surface. Slice heights between 0.013 and 0.020 inches can dramatically reduce print time and enable less dense support structures in sparse style tool designs. This can significantly reduce costs with very little impact on the finish of your tools dependent on the build orientation. Features such as scribe lines and rosettes, which are typically around 0.005 inches in depth do not print reliably even at finer slice heights. Alternatively, a trim tool can be designed and utilised as a means of secondary post-processing. Save money, reduce waste and increase your efficiency and employ the above 5 tips to ensure that your FDM composite tooling operations are optimal. Additional best practices of FDM tooling can be found in the Stratasys FDM Composite Tooling Design Guide below.